Many therapists who specialize in sexual abuse and trauma are reporting that the #MeToo movement and the ongoing accusations of sexual assault and harassment against powerful, public men are deeply affecting their clients. Sheela Raja at the University of Illinois is a practicing psychologist who also researches attitudes about sexual abuse and harassment. She says some effects of the current movement—like the way many of the women are being believed in the press—can be positive and healing for some survivors but upsetting for others. After all, most survivors’ abuse took place at a less validating time in our country’s history. Raja also says many of the survivors she knows feel a responsibility to read everything they can find about the abuse and harassment experiences of the women coming forward. At first, absorbing the stories of these courageous women may have helped them feel that they were honoring others’ pain. But during these days of daily coverage the deluge can often be too much and too triggering for some. At the Center for Contextual Change in Chicago, director Mary Jo Barrett sees a lot of sexual assault survivors, including 38-year-old sales executive Jeanine. A few weeks ago, Jeanine did something remarkable that’s brought new healing to her life—something our current cultural reckoning with sexual assault had a hand in. Sexually abused as a child by both an uncle and an older brother, Jeanine was in therapy with Barrett to work on the trauma that had followed her for decades. Married with two kids, she didn’t talk much in sessions about her relationship with her husband, until the day she walked through the door with a broken rib. At that point, Jeanine admitted her husband was both physically and sexually aggressive, and she and Barrett had to start concentrating on Jeanine’s safety. All the while, the #MeToo movement grew around them, and each day, fresh accusations against famous, sexually assaultive men filled Jeanine’s newsfeeds. She started to spiral downward. “My God,” she told Barrett. “No men can be trusted. No women are safe.” She swung between tearful empathy for all women and an overwhelm that stalled their therapeutic progress. “Maybe these women are making it up! Why didn’t they stand up to them? Maybe I should stay with my husband. Clearly, no men are any better. With him, at least I know what I’m dealing with,” she cried. But Barrett could see a ray of light in these conversations. 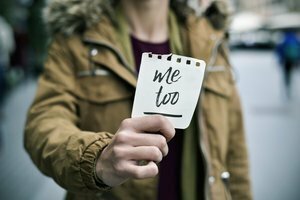 Since they’d first started working together, Jeanine had discussed feelings of both hope and shame, but as the #MeToo movement held fast, her sense of shame surrounding her abuse seemed to be evaporating. He smiled, adjusted his Colt’s cap, and said, “You shouldn’t have to wait out here alone. Let me help you.” Against her better judgement she popped the hood and stepped out to show him the engine. He slammed her against the side of the car and started groping her. At first, Jeanine felt that familiar, sick state of leaving her body while under attack, but instead of surrendering to it, she shoved and kicked him, and managed to get back into the car. A woman who’d seen what happened from the road pulled in behind her, catching the man’s license plate in her headlights before he tore away. Hands shaking, Jeanine made herself call the police. She explained what happened, and that she had a witness and a license number. They told her that they knew who the man was, that he “just does this sometimes,” and that she didn’t need to bother filing a report. At an emergency appointment with Barrett the next day, Jeanine was a wreck. Barrett was astonished to hear what had happened to her, but she also noted that the Jeanine she’d first met months earlier likely wouldn’t have kicked back or phoned the cops in the first place, while the woman before her now was literally balling her fists. Barrett took Jeanine’s lead and asked, “What haven’t you done when you’ve been violated in the past?” Well, Jeanine noted, she hadn’t spoken up. She hadn’t fought for herself. Together they brainstormed: what would continuing to fight for herself look like after this attack? They realized that because the incident happened on a freeway, it was under the jurisdiction of county sheriffs. Right there in the office, Jeanine called and got a female sheriff. The woman thanked her, told her they’d heard this guy was a menace, were grateful to have more corroboration, and would be taking action. In the weeks that followed, Jeanine finalized the protection order against her husband, hired a female attorney, and publicly shared her story at a program in Chicago set up for women going through divorce who have also been abused. Jeanine continues to work with Barrett on making changes in her life that will make her and her children safer. And with the veil of shame lifted, they spend a lot of time talking about her worth and about listening to her gut—not to the old voice in her head that told her she always had to be nice. Although Jeanine took action that brought her new healing, Barrett cautions that every abused client is different, and therapists can’t lose sight of that, especially now. Yes, it can be healing when an abuse story is believed and the survivor not vilified, but not every client is ready to go public or will be received as positively as the powerful celebrities who have made that choice. In fact, there’s a very real possibility they’ll still be further traumatized. It’s just too early in the movement to promise otherwise. And she cautions that although it can feel as if we’re in the midst of a watershed cultural moment, such a sense has gripped the therapeutic community before. “People being sexually violated is not a new phenomenon. People tell the community; the community creates a backlash to shut them up. These things happen in cycles. To me, the bigger question is how are we going to let this not be just another cycle, where the whole issue of sexual violations fades into the background,” Barrett says. And yet she acknowledges potential hints of a fomenting backlash. Already, editorials in The New York Times, the New Yorker, France’s Le Monde newspaper, and Canada’s Globe and Mail (penned by no other than Margaret Atwood, author of the feminist classic, The Handmaid’s Tale), are advising caution and suggesting some women are being infantilized by #MeToo. Did you enjoy this article? Check out more blogs on Trauma and Cultural, Social, and Racial Issues.